When I first began to do work around and within our local food system, it seemed that every single person I made contact with spoke in a special language. A language disguised by acronyms. Ahem, let’s see…there was GBCFP (Greater Birmingham Community Food Parnters), CFSC (Community Food Security Coalition), SSAWG (Southern Sustainable Agriculture Working Group), and ASAN (Alabama Sustainable Agriculture Network). Can you blame my confusion? I would sit in meetings and nod my head as if I knew what everyone was talking about and then ruuuuuuuuun back to my computer to google almost every other sentence I heard. ASAN (go head and say it out loud with me: AYE-SAAAN) continues to be a group I have the privilege to work alongside and know. ASAN is an organization that supports and connects farmers while also connecting communities. ASAN does many things including outreach, technical assistance, and providing support. You can read ALL about their work by clicking on this link: www.asanonline.org. Increase awareness and appreciation for sustainably produced food and fiber. Expand sustainable agriculture practices among farmers through education and training. Promote methods for increasing farm gate prices and easy access to markets. Promote the interests of sustainable agriculture among state and local lawmakers and officials. Help develop the next generation of sustainable farmers. Help increase food security in urban and rural areas. Create opportunities to network (for business and pleasure). Build a culturally diverse network of sustainable farmers and consumers. Create an organization that is financially and structurally sound. So you can imagine how thrilled I was when Jen Barnett at Freshfully told me about their plans to host an event at the end of this month to benefit ASAN. 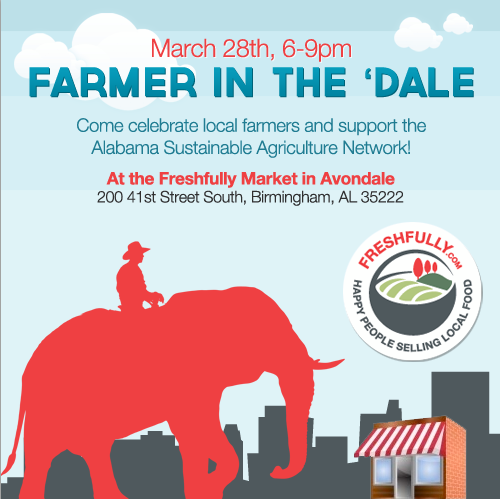 As she says, “In addition to providing funds for ASAN to offer training and support to Alabama’s family farms, it will also be a great place to meet area farmers for your market or find sources for beef, lamb, pork, seafood, and all kinds of fruits and veggies.” In other words, Freshfully is connecting some dots for which I am truly grateful. We need more dot connecting across this state! What to expect: Food, Avondale beer, cooking classes, music, neighbors, farmers, and more. In other words…you can expect PartyTown USA. Please be sure to spread the word, mmmmmmk? Oh, and what else can you do? Then just go to the Farmer in the ‘Dale event and have a FABULOUS time.